Jan Egeland, Special Advisor to the UN Special Envoy for Syria briefs the press during Intra-Syrian talks, Geneva. 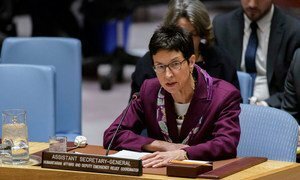 Civilians in Syria’s besieged areas have not seen a single convoy of humanitarian aid arrive for a full two months, a senior United Nations adviser said on Thursday, lamenting that diplomatic efforts appear “totally impotent,” and that hundreds of lives are being lost as a result. Briefing reporters in Geneva after a meeting of a UN-supported humanitarian task force, Jan Egeland, Special Adviser to the UN Special Envoy, said the most recent aid convoy arrived on the 28th November 2017, in the town of al-Nashibiya, and consisted of aid for only 7,200 people. Many civilians fleeing conflict areas took refuge in the area of Idlib, where fighting has since flared up, leaving them with little choice but to move on again. He added that an end to the fighting was essential, and that this would require cooperation from Russia, Iran and Turkey.